The Flame of Fortune slot has 5 reels, 3 rows and 10 paylines. 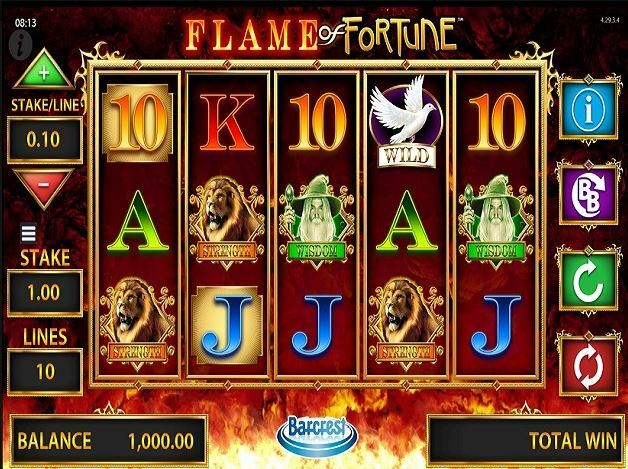 It has three bonus features which are, Wheel of Fate, The Multiplier Wild Wins bonus and Flame of Fortune Wheel. When you get 5 golden symbols on a payline you will be awarded the Fortune drop, which involves a 5×5 cascade. Wins are awarded by hitting 3 or 4 of the same symbol horizontally or vertically, replacing the winning symbols with further symbols to the Fortune drop. During the Fortune drop feature all wild symbols will substitute for all available symbols, awarding the highest possible win on any present combination. In the Wheels of Fate bonus game, will be awarded with either the Blue wheel of fate or the Red wheel of fate. The Blue wheel of fate will award the player with a chance of 1,2 or 3 gold reels. While the red wheel of fortune will award the player with a chance of getting a Gold reel, wild reel or expanding wilds. When activating the Flame of Fortune slot wheel spin feature, the player will achieve a cash prize or an enhanced Fortune drop round that includes additional game features. These additional features can consist of symbol multipliers, multiple fortune drop games or wild symbols.